Sean is a PhD candidate studying salt marsh ecosystems of the southeastern United States. He is fascinated by the swinging pendulum of disturbance and recovery in salt marshes, especially as salt marshes are increasingly threatened by sea level rise, climate change and human activities. 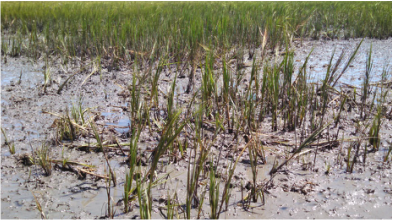 In particular, Sean is interested in the impacts physically destructive disturbances, like those caused by the rooting and wallowing of exotic feral hogs, have on biogeochemical processes, hydrology and overall salt marsh health and function. 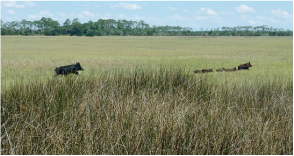 He is also interested in what players in the community and environment most facilitate or inhibit salt marsh vegetation recovery after disturbance. He hopes to continue researching coastal ecosystems through better understanding of their resilience to future disturbance and by improving and streamlining our management strategies of these beautiful and invaluable places. 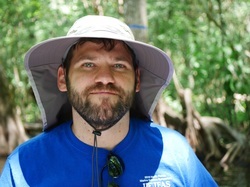 Sean’s work has been supported by the Timucuan Ecological and Historic Preserve student research grant, Society of Wetlands chapter research award, The Wetland Foundation research grant, and the HT Odum graduate fellowship research scholarship. His work has recently been featured in an article by Hakai magazine, a publication focused on coastal science and societies. Sean is also a graduate research fellow, Wetlands Club officer, and member of the Ecological Society of America and the Society of Wetland Scientists. Sean earned his B.S. degree from University of North Carolina at Asheville, where he was first introduced to both the nuisance of feral hogs and the field of wetland ecology. He continued on to graduate school at the University of Florida where he is in his final year. He lives with his girlfriend, Tyler and dog, Loki. 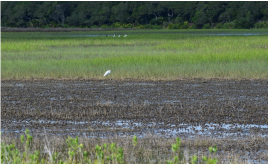 Do foraging birds help or hurt recovery of salt marsh vegetation after disturbance?